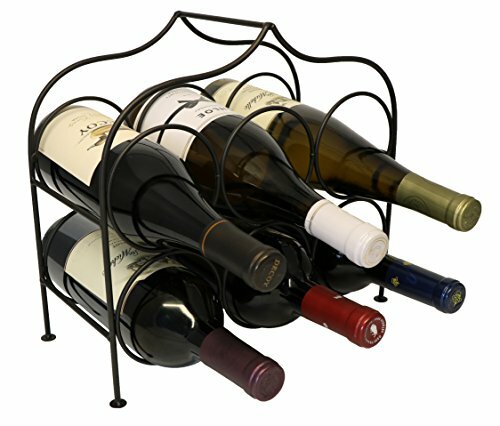 The ClarabelTM 6-bottle wine rack is designed and sold exclusively by KitchenEdge. Measurements: 12.4" (31.4cm) wide, 11.25" (28.5cm) tall, 5.5" (14.0cm) deep front to back. No assembly required. Free standing. BEAUTIFUL DESIGN: The ClarabelTM wine rack has a modern design with smooth curves to compliment your décor. HOLDS SIX (6) 750mL WINE BOTTLES: The ClarabelTM wine rack is designed to hold six (6) 750mL wine bottles up to 3.5" in diameter, including large-diameter Chardonnay bottles. STURDY CONSTRUCTION: The ClarabelTM wine rack is made with high quality iron wire specially treated with an anti-rust matte black finish. Padded feet to protect table and counter surfaces. THE PERFECT GIFT: The ClarabelTM 6-bottle wine rack comes packaged in a beautiful gift box. It's the perfect gift for weddings, anniversaries, holidays and other special occasions.